Admission Open for preparatory courses 2018 / 2019.
up to 10 December 2018! This site was created for those who intend to study abroad, and chosen for study Russia. Those students, who intend to study in Russia, at first, have to study Russian language for one year (preparatory training). But if you want to study medicine, information technology, mechanical engineering, electrical technology or management in English, you do not need spend one year for preparatory training. How can I get invitation from Russian State University for study in Russia? - You will need to send me email with scanned documents. What should I do to be able to come and study in Russia? - You will have to obtain a visa as a student. How can I get a visa as a student? 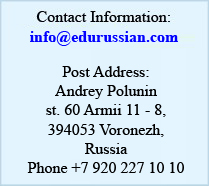 - You will have to submit to Embassy of Russian Federation, invitation from Russian State University. What documents should I submit to get invitation from Russian University? 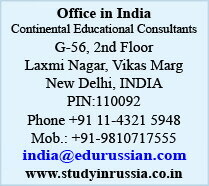 application form for study in Russia and send me email with scanned copies of required documents for study in Russia. I'll check all your documents, if your documents are in order, State University will make for you invitation for study in Russia. It takes one month to make invitation. When invitation is ready, I will send it to you by DHL. State Universities of Russia have a well-established reputation for excellence in teaching and research and is consistently ranked amongst the top universities of the world by both government and independent surveys. Russian language courses and other international study programs for international students. Institute of International Education specializes on teaching pre-study Russian to international students at beginner and pre-intermediate levels, providing courses tailored to suit their needs depending on their further area of specialization at Russian State Universities. Our staff research interests lie in such areas as Russian grammar, computer-aided testing of Russian as a foreign language, using video and audio materials in teaching Russian and contrastive linguistics.